It looks like Intel X79 boards are making the rounds, and here is a tasty one, the Gigabyte GA-X79A-UD3. This is only a mid-range board, others are sure to follow. 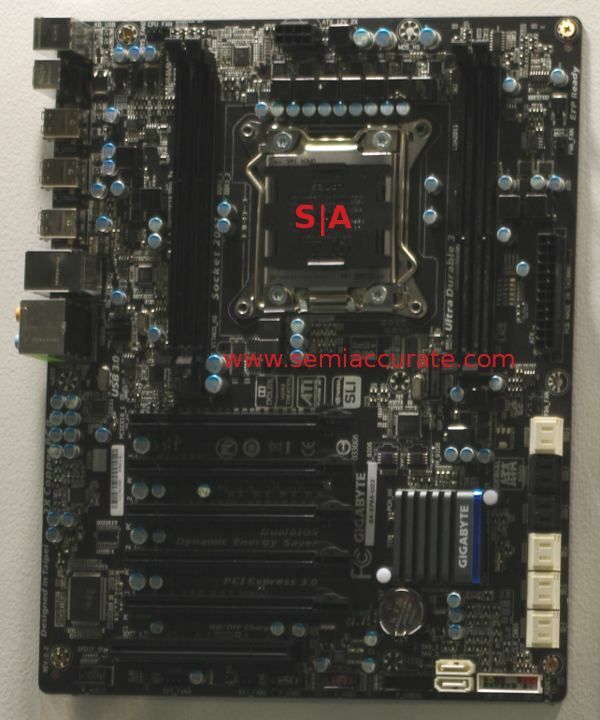 The board is based on Intel’s X79 chipset for the upcoming Sandy Bridge-E CPU, aka Socket 2011 chips. This is the true Sandy Bridge part, 4 memory channels, a chipset with USB3 support, and SATA 3 as well. It is not bandwidth crippled like the current versions, so it should be the gamer part of choice in Q4. We had a hard time getting pictures of the board, something about areas that we weren’t supposed to be at and all that, so excuse the lighting. That said, you can see there are no less than 14 SATA ports, not to mention 5 PCIe slots as well. The board sadly only has four memory slots, 1 DIMM per channel, the lone weak spot for Sandy-E.